If you’re a happy – that’s a relative term – rabbit owner, you might have noticed that your bun is either super active when you’re trying to get to sleep or he’s waking up too early for breakfast and running around when you’re in that sweet stage of early morning sleep. While you might try to teach him the way of the humans in terms of daily routine and sleep, he might not give a damn about it and follow his natural ways. The daily routine and sleeping patterns of rabbits differ a lot from ours. While some animals have daily routines and sleeping patterns similar to us, rabbits don’t and that’s where the occasional troubles arise. Try sleeping when your bun is all happy and active. You might find that quite hard to do. Rabbits are prey animals, which means that evolution made them adapt their behaviors and sleeping patterns to various other circumstances and creatures, and here we’re talking especially about the predators. Since they can easily become lunch if they’re not cautious and guard themselves against every animal that hunts them, rabbits have developed certain habits and sleeping patterns. Similar to other animals like cats, rabbits are crepuscular creatures, which means that they’re most active during dusk and dawn times, staying up late in the evening and waking up early in the morning and sleeping and dozing off during the night and day. You might think that your bun doesn’t have to hide or run away from any chasing animals because he’s safe inside your home, but the truth is that he’s got the same behavior patterns as his wild ancestors and his natural instincts are still there. Domestic rabbits still have – at least to a certain extent – that same evolutionary instincts as their brothers living into the wild. Rabbits have developed their sleeping patterns in such a way as to avoid falling prey to dangerous predators lurking in the shadows. And since predators are most active during dawn and dusk, so are rabbits. They’ve got to be fully awake and active in order to escape and hide from danger. When the sun is at a low angle, which happens at dawn and dusk, it’s a lot easier to spot predators, which is why it’s the perfect time for rabbits to get out of their burrows and hiding spots to search for food and socialize with other fellow rabbits. A rabbit’s usual day goes on as follows. They wake up at dawn and are active until mid morning, time in which they forage for food – or breakfast for domestic ones, eat, groom, play and usually anything that will consume their energy. After that, they’ll go back to their den or sleeping area and stretch out for some sleep and naps. They can occasionally go out for short periods of time during the day to have a snack or use the litter box, but it’s not uncommon for them to sleep for hours during that time of day. When the evening comes they repeat most of the morning activities. In addition to that, you should know that they’re a lot more sociable than in the morning, so take advantage of that to get some fun and relaxing time with your fellow furry friend. They continue their activity until late in the evening, even after you’ve gone to sleep and will settle for a few hours of nap time during the middle of the night before starting all over when the – early – morning comes. In general, rabbits have their strict meal times, natural daily routine and sleeping patterns and it’s a good idea not to disturb them during their sleep times and even adhere to them and have their food ready exactly when they need it. 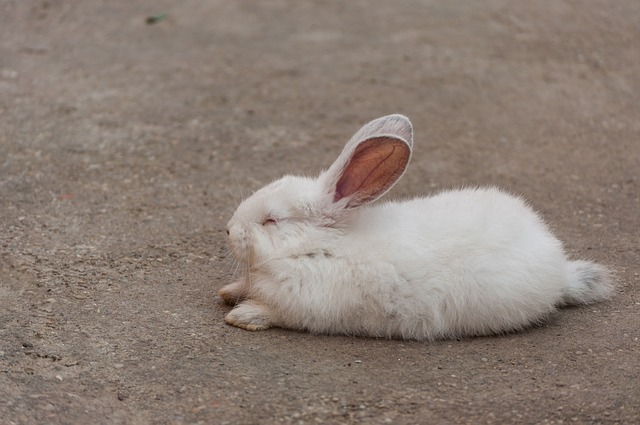 When it comes to how much do rabbits sleep, that depends on a lot of factors, but they usually reach at least six hours of sleep and sometimes as much as ten. We now know that the rabbit sleeping patterns are entirely different to hours, but that’s not the only difference when it comes to how rabbits sleep. Their sleep cycles are as well different, and for the same reasons stated above. Rabbits always need to be on alert for danger and predators, so they’ve evolved to do that even when they sleep. That translates into shorter and lighter sleep stages and the ability to wake up on a moment’s notice if there’s any danger in the immediate surroundings. Also, during their sleep times, they will sleep in short bursts, so if you notice that your bun is waking up frequently, you shouldn’t worry. His sleep is not disturbed, it’s just how they naturally sleep. In addition to their short and frequent sleep cycles, rabbits have also evolved to sleep in positions that assures them a quick escape should anything happen. Usually they love the comfort provided by sleeping with other fellow rabbits and they’re often found sleeping in funny positions. In cold climates they will curl their little bodies to limit the exposure to cold air and in hot climates they will stretch out to maximize air flow through their fluffy hair coat. As a conclusion, try to observe your rabbit’s sleeping patterns and daily routine and follow that instead of trying to change it. That if you don’t want a grumpy bunny in your home. 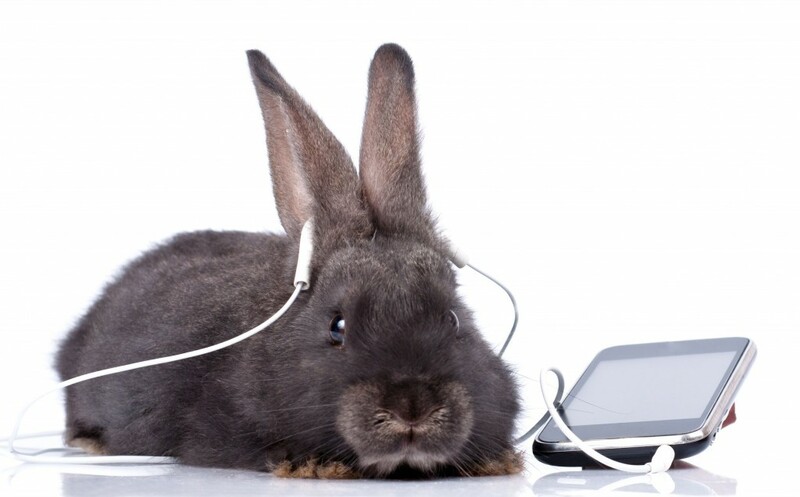 In general, domestic rabbits will adapt to an extent to their owner’s habits and routines, but you should always leave room for them to do so. The most important thing is to let the bun alone if you find him snoozing and use their most active hours, early morning and late evening to play and cuddle, as that’s when they’re most active and sociable.